I know everyone makes fun of California(ns), and rightfully so, for overreacting to a little rain (this clip comes to mind). But there’s no denying that we had a potent little storm this past weekend, and there’s more on the way! So what better way to remedy this cold, gloomy weather, than cozying up with a rose and earl grey tea latte. I have to admit, my predilection for coffee has stunted my relationship with tea, among other compelling non-alcoholic beverages. I’m making it a goal to get more creative with my elixirs this year (Lily & Tracy come to mind). So far I’m off to a good start because I’m thrilled with how this tea latte turned out. I don’t drink much Earl Grey – not because I dislike it, but because Audrey was raised on English breakfast, so naturally that’s what we drink. However, in this case I wanted a black tea that was a bit more delicate, so as not to overpower the rose. Earl Grey was the perfect choice. The result is a luscious, warm, and insanely aromatic cup of tea. All I wanted to do was hold it in front of my face all weekend. 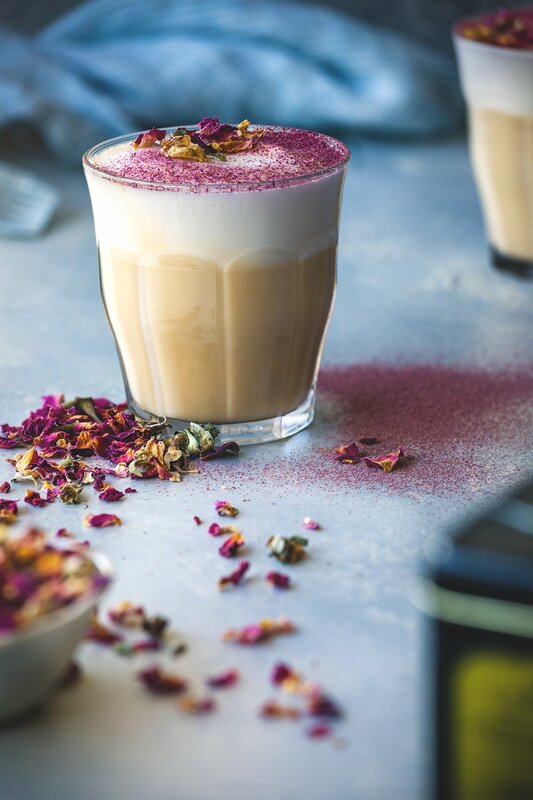 For the garnish, I took a few styling tips from The Rabbit Hole Tea Bar, who do a lovely dusting of rose petals atop the silky foam. All in all, I can’t think of a better way to hide from the rain. I hope you feel the same! 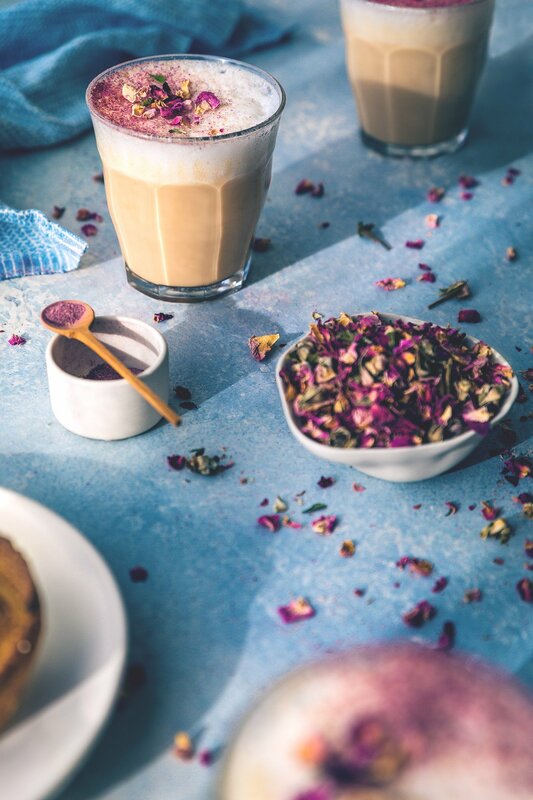 The subtle flavors of Earl Grey and rose combine to create a luscious, warm, beautiful, and insanely aromatic cup of tea. Add the sugar and water into a small saucepan over medium heat. Cook until the sugar dissolves, turn off heat, add the rose petals and steep for 5 minutes. Strain through a fine mesh strainer, pushing on the petals to extract as much of the remaining syrup as possible. Combine the Earl Grey tea with the rose petals, and steep in boiling water for 5 minutes. Discard the tea. Mix the rose syrup with milk, and froth with a milk frother to your desired warmth and foam. Fill your mug halfway with tea (~4 oz), and then add the steamed milk (~4 oz). Garnish with a few dried rose petals. 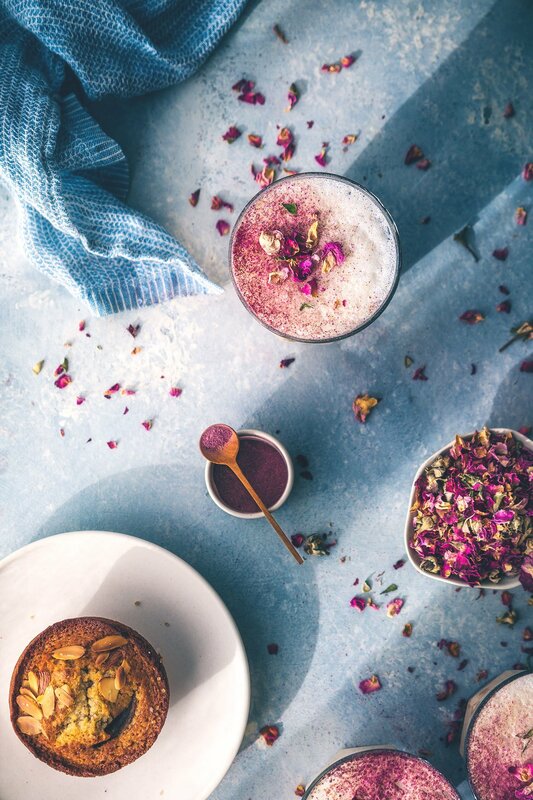 If you'd also like to add some rose dust for garnish, simply add a handful of dried rose petals to a spice grinder, and pulse until they reach a fine powder. Use a fine mesh strainer to give a light dusting of rose powder atop the drink. *If you don't have an atomizer, you can add a splash of rosewater to your empty mug, swirl around the inside, and discard before mixing your drink. Again, the rosewater is optional, but a light misting on the empty mug really help boost the aromatics of the drink, thereby enhancing the flavor. Yumm, need to try this recipe! It looks perfect! will try to make it at home, 2 of the ingred are my fav! thank you for sharing! This is beyond good – thank you, Thank You,THANK YOU! I bet you could also melt a piece of rose flavored Turkish Delight (coated in milk chocolate) in a cup of hot milk – got to be good. I’ll try that next. Brilliant post. Thank you, Todd! This looks almost too pretty to drink! As a major fan of Earl Grey, I’ll definitely be trying it. I tried this just today for the sake of a recurring social media theme I do named #TeaTimeTues. I am an avid tea lover and a fan of earl grey particularly and I used dried rose petals and rosewater however I’ve never paired with earl grey. My nightly moisture routine consists of using rosehip oil on my skin. The instructions were great and although you noted as optional, the rosewater is an absolute most! The aroma is just divine and further compliments the experience overall of drinking this latte. I love now having rose syrup and trying I’m to see what else I can do with it cause I had some leftover. The only thing I would do differently, is add the rosewater to the milk once frothed. I add frothed milk to my tea often and have a frother that is consistent but for some reason, I didn’t get the stiff peaks that I typically get so I don’t know if the rosewater dilutes it or something but I think I would add to the milk once frothed instead of before. But this turned out great and was delicious. I took pics which I will be posting to my IG @bagladies. Thank you so much for sharing! Thank you for inspiring me to actually want to make tea! Any tips on tools/methods for frothing the milk? This looks so incredible, I’m crazy about rose flavored things so this is right up my alley! I love, love, love this so much. It reminds me a kind of tea I drink called, Edith Grey. A blend of black tea, bergamot, and rose petals. The colors, and textures, and light are just divine. I absolutely LOVE all the drink recipes here. You truly are an inspiration for other bloggers!! 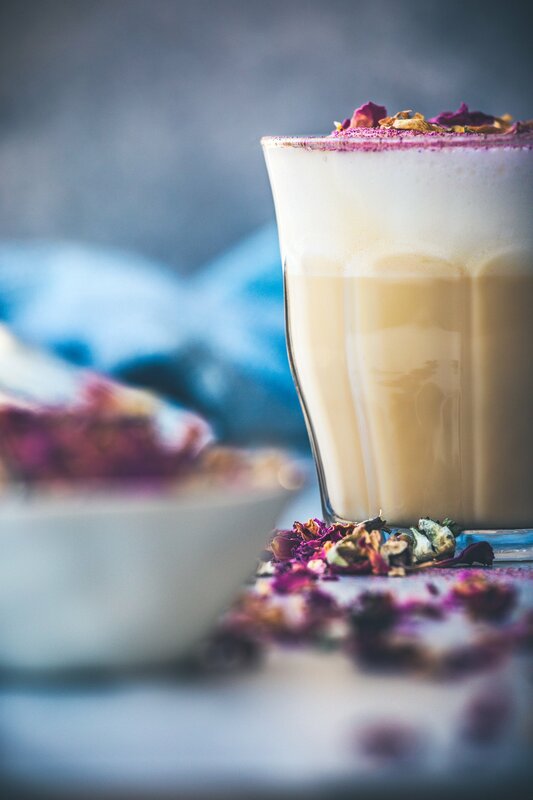 Love this latte and the rose petal dust, it’s just gorgeous. The rose and earl grey combination sounds delightful. what muffin is in the picture with the latte? Almond? These pictures are stunning!!! If you would ever want to collaborate on making medicine and increíble drinks like this together, id love to send you jungle Tonics. thank you for your magic!! Oh what I would give for just rain! Ha! Must be the Midwestern-er in me 🙂 Between the rose and the earl grey tea, this is so perfect! This is beyond beautiful! I’m sure the rainy weather is a nice cozy change for you guys! The first snowfall around here causes everyone to forget how to drive, so the Californian’s reactions to the unusual weather are understandable 🙂 can’t wait to cozy up with this beautiful tea! Truly stunning. I love earl gray and rose syrup, but never tried them together in a latte. You made it look so beautiful and appetizing that I want to stop what I am doing and go into the kitchen to make some. this is just beautiful! i love tea lattes; there’s a “coffee” shop up in pdx called tea bar that specializes in them. 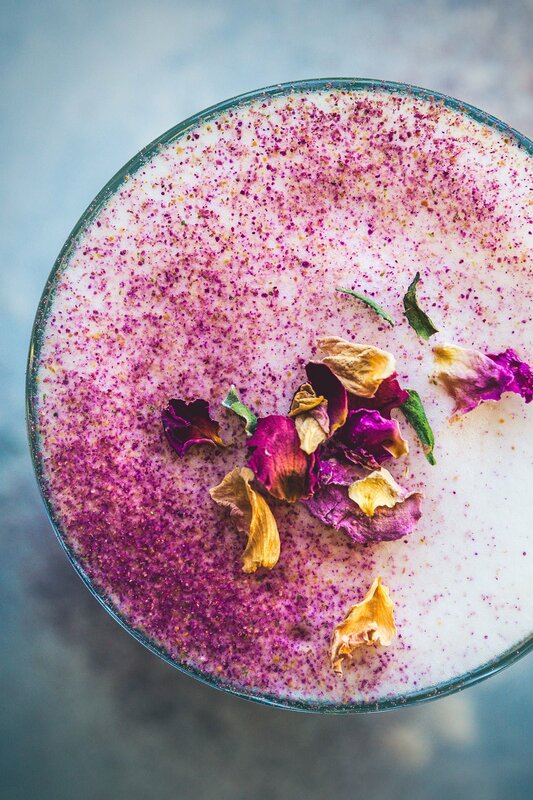 their london fog is actually very similar to this drink, but with lavender instead of rose! Thank you SO much Amanda! You really should give it a try. I’m not quite sure what I would do if I experienced Minnesota weather, if even for a day! Probably never leave my bed…ha!